On July 24th, Google announced a new product that turns your TV into a media hub. Titled the Chromecast, this small device allows you to “cast” your media from Netflix, Google Play Movies & TV, and even Google Play Music. Selling for $35 a pop on the Google Play Store, Amazon and Best Buy, the Chromecast also came with a free three month coupon for Netflix. However, due to the curiosity that the Chromecast came with, many of these places had a hard time keeping them on their shelves, and Google had to stop the Netflix promo. I purchased my Chromecast through Best Buy on their website. It took about four days to actually get to me, and I was still able to get the free Netflix promotion (as far as I know, Best Buy is the only company that is still offering the Netflix promo). When the Chromecast arrived, I immediately opened up the box and took a look inside. 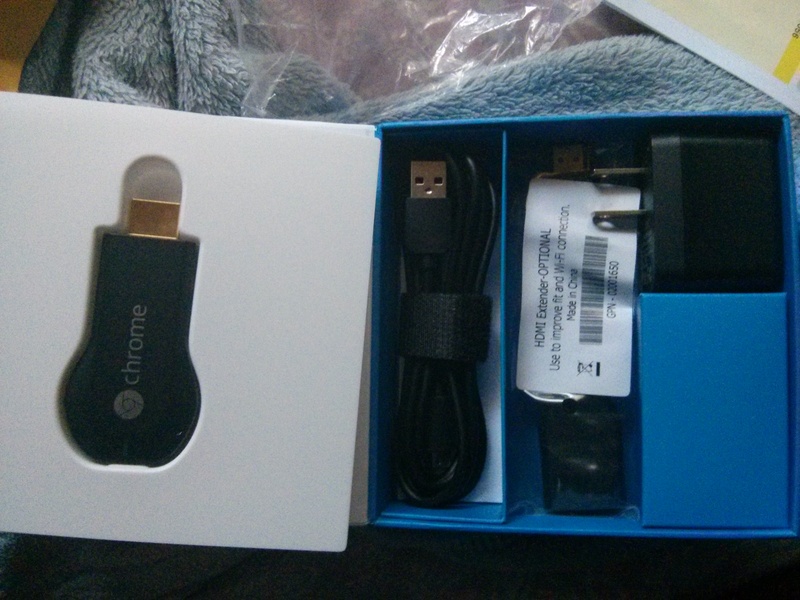 Inside the box you get the Chromecast itself, a micro USB cable, a wall adapter and an HDMI extender. To operate the Chromecast, you need to plug it into an HDMI port on your TV and plug the micro USB cable into your Chromecast and either the wall, or another USB port. I plugged mine into my cable box, which had an HDMI port. Once you’ve got the device plugged in, you can use your smartphone, tab or computer as a remote. The initial setup process is very quick. When you first turn it on, you see a screen that prompts you to set up the Chromecast. 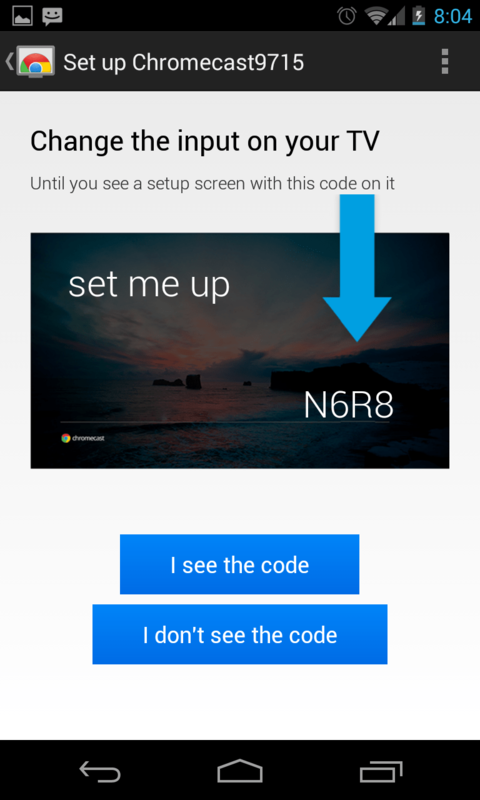 To do this, you need to go to Google.com/Chromecast/Setup on either your phone or computer (or you can use the app). 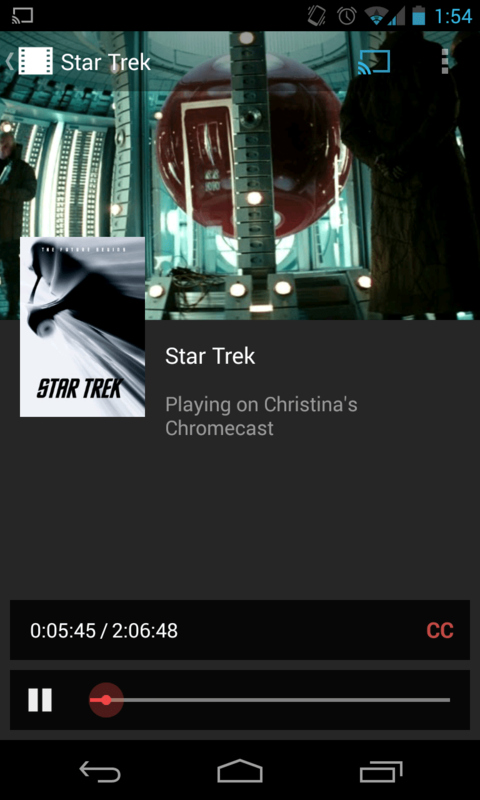 If you go to the website on your smartphone (like I did), you’ll be prompted to download the Chromecast app. Your first time around, your Chromecast will be pre-named. The app will prompt you to set it up. The app will ask you to choose your wireless network and input your password. Then you’ll be able to name the Chromecast. You’ll also be asked to verify a code that will show up on your TV. When you’re done setting that up, you’ll be ready to begin casting content! Let’s get into the good part- the streaming. To use the Chromecast, you need to use one of three apps (currently, however there are rumored to be more apps coming that will allow you to cast your favorite content). You can currently use either Netflix, Google Play Movies & TV or Google Play Music. So far, I’ve been enjoying using Netflix and Google Play Movies & TV. 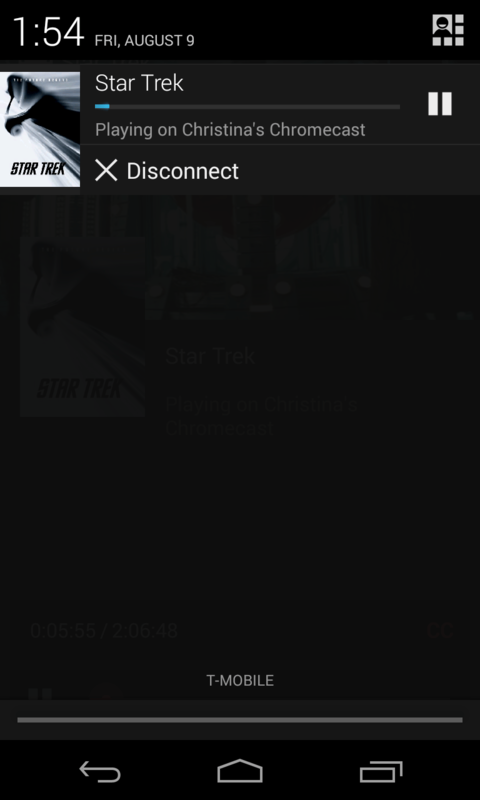 If you open up Google Play Movies & TV and connect to WiFi, you’ll see a fancy icon that looks like a TV screen with a sideways WiFi signal. If you tap the signal, it’ll have you select the Chromecast that you want to cast to. Once you select that, you can then choose the movie that you want to watch. For review purposes, I chose Star Trek. Playing your media is simple. Once you’ve selected the desired Chromecast and the movie or tv show you want, the Chromecast gets to work and plays your media. You then have the option to pause your media, go forward or backwards and even turn on captions. You can also use your phone while you’re casting things. You can also cast YouTube videos and tabs from Chrome on the Chromecast. I used this tool to watch a few music videos and video reviews of phones. I then casted one of my tabs. It worked pretty well, however I noticed that sometimes it would just stop casting the tab, and I would need to re-cast the tab. It is important to note that this feature is in beta currently, so it might have some hiccups. I absolutely love the Chromecast. It’s a great tool, and the cost makes it even easier to justify buying. My personal uses for it will definitely be for watching media and showing people what’s on my screen. I’m really excited for the future of Chromecast, and I hope that it continues to grow better. I highly recommend grabbing one whenever they become available. Currently, Amazon has quite a backorder. Google Play hasn’t had any available in a while, and Best Buy gets some every now and then. It’s definitely worth the $35 price tag! To grab a Chromecast, visit the Google Play Store, Amazon or Best Buy. 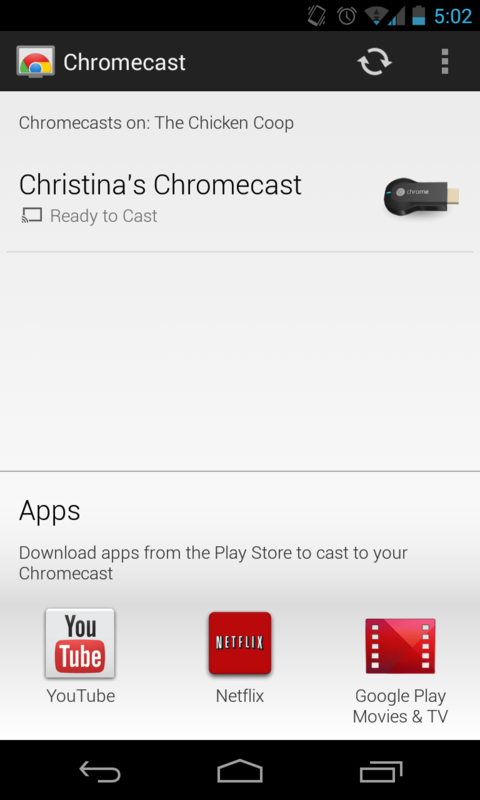 According to the Play Store, Chromecasts start shipping in 3-4 weeks. Amazon states that shipping will start in 3-4 months, however I’m not really sure how likely that is. Best Buy is currently sold out of Chromecasts online, and they’ve been difficult to grab in stores. The Best Buy website does state that they are still offering the Netflix promo, though.